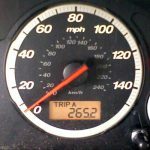 I’ve written in the past about the accuracy (or not) of EPA gas mileage estimates, and I also chronicled our purchase of a 2005 Honda CR-V (LX, 2WD). Being a bit of a stats freak, I thought that it might be interesting to take a look at how well this car does relative to the EPA estimates. The EPA numbers for a Honda CR-V LX with 2WD are 29 mpg for highway driving, and 24 mpg in the city. So how do the real world numbers compare? Well, on a recent roadtrip (ca. 90% highway, 10% city) I averaged around 25.6 mpg. In contrast, my ‘typical’ driving (more like 50%/50%) nets me around 21.1 mpg. Note that these numbers reflect cool-season driving, so there’s little or no air conditioning involved. If we scale the EPA numbers accordingly, I should have gotten somewhere around 28.5 mpg on the roadtrip and 26.5 during typical driving. In other words, my real world experience with this car was around 10% low on the roadtrip, and around 20% low otherwise. Not a huge surprise here, as the EPA numbers often turn out to be over-estimates. But my numbers aren’t nearly as bad as Consumer Reports suggested they would be (CR says to discount conventional car and truck mileage estimates by 30% when shopping for a car). Then again, heavy use of the AC during the summer would certainly have a negative impact on mileage. I notice that my 05 CRV EX gets about 300 miles on a totally full tank, doing mostly city driving. I think the tank is 15 gallons. So quite a bit less than I was expecting. Always good to keep track of gas mileage becasue a sudden loss can give you the heads up that something is wrong before really doing damage to the car. Check out the Your MPG list at FuelEconomy.gov. Drivers can enter their MPG under real-world driving conditions. It appears that 2006 CR-V (4WD) drivers get an average of 24.9 MPG.